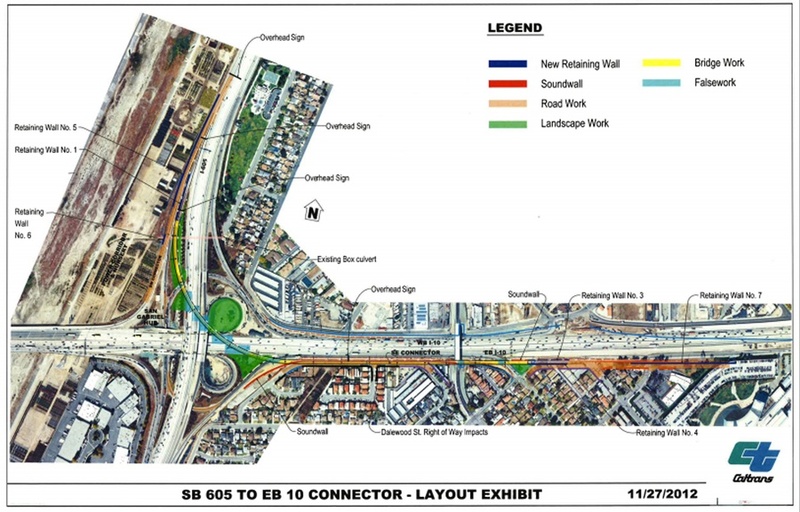 This $66 million design-build project creates a new flyover bridge from the southbound San Gabriel River Freeway (I-605) to the eastbound San Bernardino Freeway (I-10) in order to improve traffic flow and reduce delays caused by merging traffic. This 18 span, 3364 ft.-long concrete box girder bridge was built cast-in-place on falsework in five frames varying in length from 447’ to 720’ and separated by hinges. The spans vary in length from 140’ to 233’ at a maximum height of 54’ above ground along a 880’ radius curve. All 3’-6” diameter piers are supported by 4’-0” diameter monoshaft foundations. The 30 ft.-wide cross-section utilizes a dual-cell box. FINLEY provided design review, longitudinal construction analysis, and transverse design analysis.